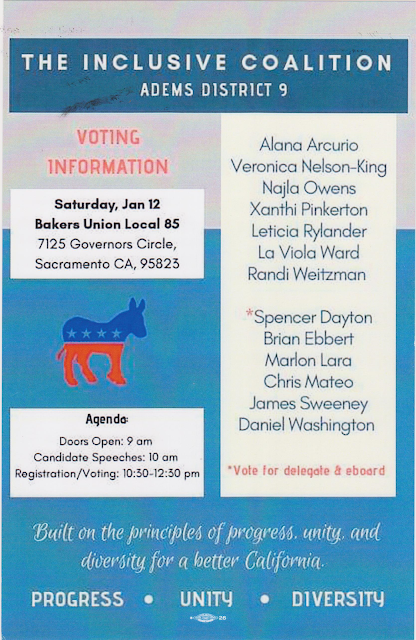 In a battle between progressives and moderates in the Democratic Party, the progressives scored a victory on Saturday in party delegate battle held in Sacramento on Saturday, January 12. 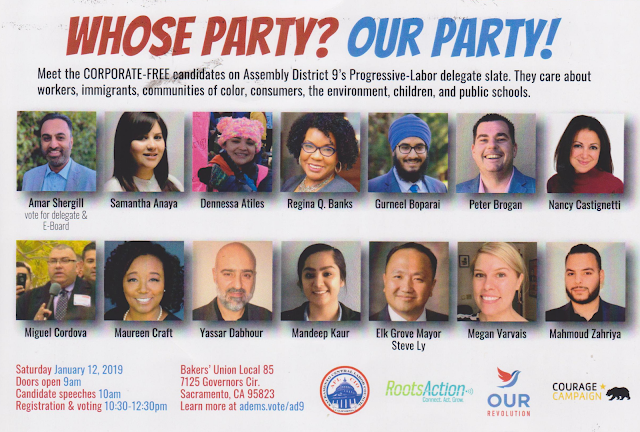 In the delegate battle for the California Democratic Party's California 9th Assembly District, a group of 14 delegates (see photo and names above) led by Amar Shergill was elected as delegates in the party members-only vote. The Shergill led progressives defeated a group of moderates led by Democratic Assemblymember Jim Cooper (see photo below) who represents the 9th District, which includes all of Elk Grove and Galt, and portions of Sacramento, Lodi and unincorporated areas in Sacramento and San Joaquin counties. The 14 delegates - seven women and seven men - include Elk Grove Mayor Steve Ly and Maureen Craft, who ran for the Elk Grove City Council on 2016. Craft is said to be exploring a run for elected office in 2020. While Shergill's slate has twice won the biennial contest starting in 2017, his team included a new twist with the inclusion of Ly. In 2017 Ly ran an opposing slate of 14 candidates that was defeated. "The success of the Progressive Labor Alliance across Sacramento County for several election cycles is a testament to the power of grassroots activism. We can never defeat big money with more big money; the answer is always big organizing," Shergill said. "We look forward to joining with all Democrats to ensure that the voices of working families are heard in the Party." Additionally, Shergill was reelected to the California Democratic Party's executive board.